Since 2013, CRE has hosted 5 annual national conferences. Over 250 youth from across Canada gathered in Sudbury from February 22-24, 2018 to be part of our biggest conference yet. 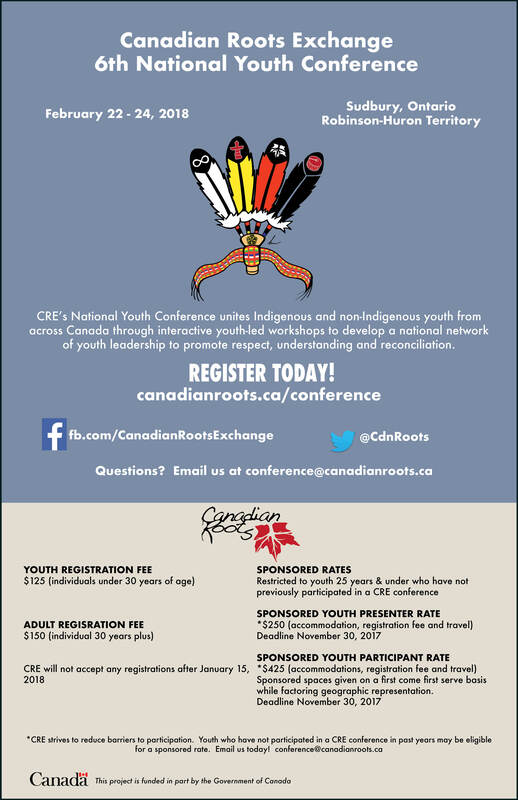 The CRE National Youth Conference is facilitated by youth, for youth. Through the conference, we aim to to facilitate sharing between Indigenous and non-Indigenous youth, encourage youth to engage in interactive dialogues on the significance of solidarity and reconciliation, and challenge negative stereotypes that divide communities. Through this opportunity, young people continue to develop a national network of youth that promotes respect and understanding between all people living in Canada. The conference was primarily hosted at the main campus of Laurentian University with some other sessions, including evening programming taking place off-campus. If you are youth under 30 years of age, the registration fee is $125. This includes all 3 days of programming, a conference swag bag and lunches on the 3 days of the conference. How do I register to attend as a participant? How do I register to present? 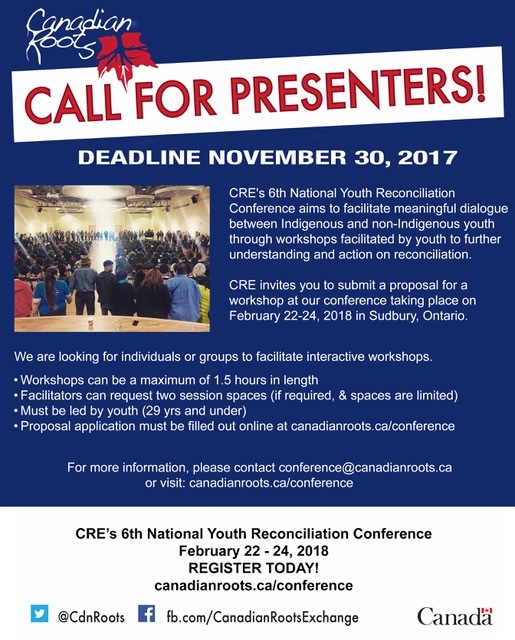 In order to make the conference accessible to youth travelling from out of town, CRE has a limited number of bursaries which are available to first time presenters or participants. The bursaries provide a highly subsidized rate for travel and accommodations and includes registration. Youth 25 years and under are eligible for a bursary if they have not been part of a CRE conference in previous years. The deadline to apply for a sponsored participant or presenter spot is November 30, 2017 . All eligible youth who are awarded sponsored rates will have their travel facilitated directly through CRE’s travel agent who will take care of their travel arrangements. 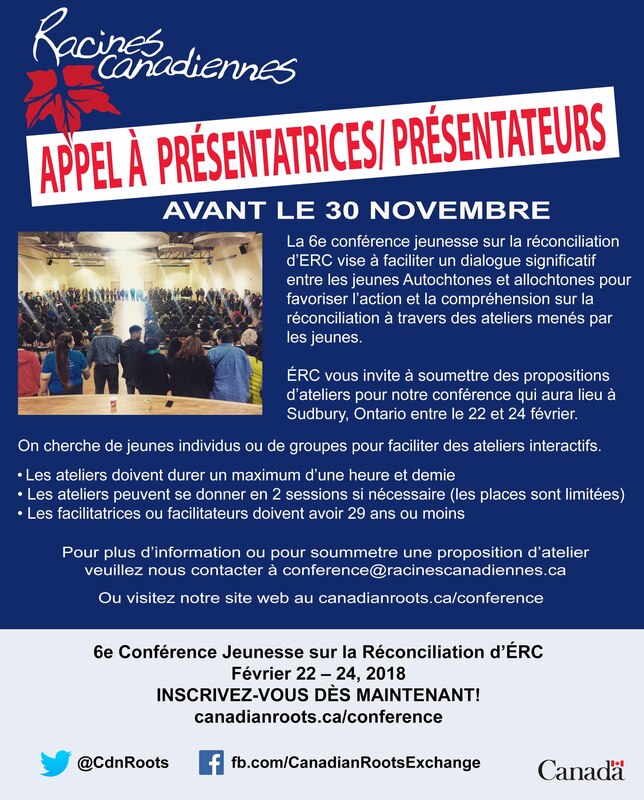 If you are a young person who does not require or is not eligible for a sponsored rate you are still welcome to apply to our conference but you would not be able to receive any financial support for travel or accommodations. You are, however welcome to special air fare rates and preferred hotel rates that CRE has negotiated by contacting CRE’s travel agent or the Travelway Inn directly. 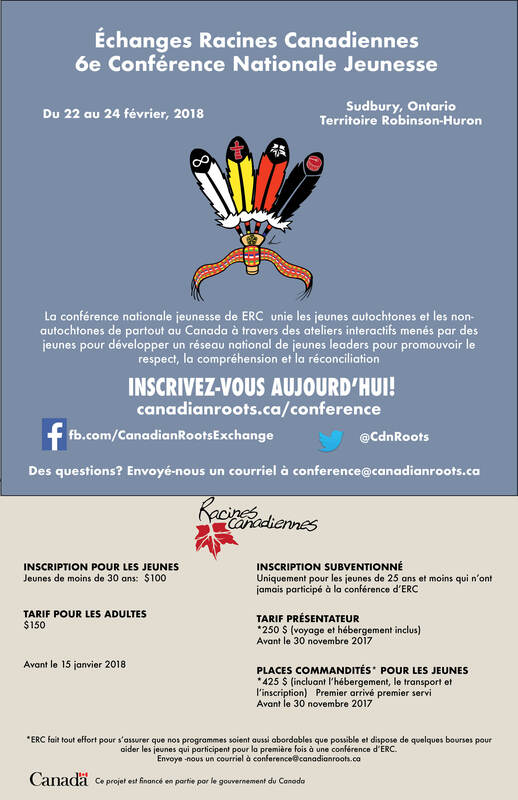 If you have any additional questions lease email conference@canadianroots.ca with any further questions!